Muscle contraction is the activation of tension-generating sites within muscle fibers. In physiology, muscle contraction does not necessarily mean muscle shortening because muscle tension can be produced without changes in muscle length such as holding a heavy book or a dumbbell at the same position. The termination of muscle contraction is followed by muscle relaxation, which is a return of the muscle fibers to their low tension-generating state. Muscle contractions can be described based on two variables: length and tension. A muscle contraction is described as isometric if the muscle tension changes but the muscle length remains the same. In contrast, a muscle contraction is isotonic if muscle tension remains the same throughout the contraction. If the muscle length shortens, the contraction is concentric; if the muscle length lengthens, the contraction is eccentric. In natural movements that underlie locomotor activity, muscle contractions are multifaceted as they are able to produce changes in length and tension in a time-varying manner. Therefore, neither length nor tension is likely to remain the same in muscles that contract during locomotor activity. In vertebrates, skeletal muscle contractions are neurogenic as they require synaptic input from motor neurons to produce muscle contractions. A single motor neuron is able to innervate multiple muscle fibers, thereby causing the fibers to contract at the same time. Once innervated, the protein filaments within each skeletal muscle fiber slide past each other to produce a contraction, which is explained by the sliding filament theory. The contraction produced can be described as a twitch, summation, or tetanus, depending on the frequency of action potentials. In skeletal muscles, muscle tension is at its greatest when the muscle is stretched to an intermediate length as described by the length-tension relationship. Unlike skeletal muscle, the contractions of smooth and cardiac muscles are myogenic (meaning that they are initiated by the smooth or heart muscle cells themselves instead of being stimulated by an outside event such as nerve stimulation), although they can be modulated by stimuli from the autonomic nervous system. The mechanisms of contraction in these muscle tissues are similar to those in skeletal muscle tissues. Muscle contractions can be described based on two variables: force and length. Force itself can be differentiated as either tension or load. Muscle tension is the force exerted by the muscle on an object whereas a load is the force exerted by an object on the muscle. When muscle tension changes without any corresponding changes in muscle length, the muscle contraction is described as isometric. If the muscle length changes while muscle tension remains the same, then the muscle contraction is isotonic. In an isotonic contraction, the muscle length can either shorten to produce a concentric contraction or lengthen to produce an eccentric contraction. In natural movements that underlie locomotor activity, muscle contractions are multifaceted as they are able to produce changes in length and tension in a time-varying manner. Therefore, neither length nor tension is likely to remain constant when the muscle is active during locomotor activity. An isometric contraction of a muscle generates tension without changing length. An example can be found when the muscles of the hand and forearm grip an object; the joints of the hand do not move, but muscles generate sufficient force to prevent the object from being dropped. In isotonic contraction, the tension in the muscle remains constant despite a change in muscle length. This occurs when a muscle's force of contraction matches the total load on the muscle. In concentric contraction, muscle tension is sufficient to overcome the load, and the muscle shortens as it contracts. This occurs when the force generated by the muscle exceeds the load opposing its contraction. During a concentric contraction, a muscle is stimulated to contract according to the sliding filament theory. This occurs throughout the length of the muscle, generating a force at the origin and insertion, causing the muscle to shorten and changing the angle of the joint. In relation to the elbow, a concentric contraction of the biceps would cause the arm to bend at the elbow as the hand moved from the leg to the shoulder (a biceps curl). A concentric contraction of the triceps would change the angle of the joint in the opposite direction, straightening the arm and moving the hand towards the leg. In eccentric contraction, the tension generated while isometric is insufficient to overcome the external load on the muscle and the muscle fibers lengthen as they contract. Rather than working to pull a joint in the direction of the muscle contraction, the muscle acts to decelerate the joint at the end of a movement or otherwise control the repositioning of a load. This can occur involuntarily (e.g., when attempting to move a weight too heavy for the muscle to lift) or voluntarily (e.g., when the muscle is 'smoothing out' a movement or resisting gravity such as during downhill walking). Over the short-term, strength training involving both eccentric and concentric contractions appear to increase muscular strength more than training with concentric contractions alone. However, exercise-induced muscle damage is also greater during lengthening contractions. During an eccentric contraction of the biceps muscle, the elbow starts the movement while bent and then straightens as the hand moves away from the shoulder. During an eccentric contraction of the triceps muscle, the elbow starts the movement straight and then bends as the hand moves towards the shoulder. Desmin, titin, and other z-line proteins are involved in eccentric contractions, but their mechanism is poorly understood in comparison to crossbridge cycling in concentric contractions. Though the muscle is doing a negative amount of mechanical work, (work is being done on the muscle), chemical energy (in fat, glucose or ATP) is nevertheless consumed, although less than would be consumed during a concentric contraction of the same force. For example, one expends more energy going up a flight of stairs than going down the same flight. Muscles undergoing heavy eccentric loading suffer greater damage when overloaded (such as during muscle building or strength training exercise) as compared to concentric loading. When eccentric contractions are used in weight training, they are normally called negatives. During a concentric contraction, muscle myofilaments slide past each other, pulling the Z-lines together. During an eccentric contraction, the myofilaments slide past each other the opposite way, though the actual movement of the myosin heads during an eccentric contraction is not known. Exercise featuring a heavy eccentric load can actually support a greater weight (muscles are approximately 40% stronger during eccentric contractions than during concentric contractions) and also results in greater muscular damage and delayed onset muscle soreness one to two days after training. Exercise that incorporates both eccentric and concentric muscular contractions (i.e., involving a strong contraction and a controlled lowering of the weight) can produce greater gains in strength than concentric contractions alone. While unaccustomed heavy eccentric contractions can easily lead to overtraining, moderate training may confer protection against injury. Eccentric contractions normally occur as a braking force in opposition to a concentric contraction to protect joints from damage. During virtually any routine movement, eccentric contractions assist in keeping motions smooth, but can also slow rapid movements such as a punch or throw. Part of training for rapid movements such as pitching during baseball involves reducing eccentric braking allowing a greater power to be developed throughout the movement. Eccentric contractions are being researched for their ability to speed rehabilitation of weak or injured tendons. Achilles tendinitis and patellar tendonitis (also known as jumper's knee or patellar tendonosis) have been shown to benefit from high-load eccentric contractions. In vertebrate animals, there are three types of muscle tissues: skeletal, smooth, and cardiac. Skeletal muscle constitutes the majority of muscle mass in the body and is responsible for locomotor activity. Smooth muscle forms blood vessels, gastrointestinal tract, and other areas in the body that produce sustained contractions. Cardiac muscle make up the heart, which pumps blood. Skeletal and cardiac muscles are called striated muscle because of their striped appearance under a microscope, which is due to the highly organized alternating pattern of A bands and I bands. Excluding reflexes, all skeletal muscles contractions occur as a result of conscious effort originating in the brain. The brain sends electrochemical signals through the nervous system to the motor neuron that innervates several muscle fibers. In the case of some reflexes, the signal to contract can originate in the spinal cord through a feedback loop with the grey matter. Other actions such as locomotion, breathing, and chewing have a reflex aspect to them: the contractions can be initiated both consciously or unconsciously. influx causes synaptic vesicles containing the neurotransmitter acetylcholine to fuse with the plasma membrane, releasing acetylcholine into the synaptic cleft between the motor neuron terminal and the neuromuscular junction of the skeletal muscle fiber. Acetylcholine diffuses across the synapse and binds to and activates nicotinic acetylcholine receptors on the neuromuscular junction. Activation of the nicotinic receptor opens its intrinsic sodium/potassium channel, causing sodium to rush in and potassium to trickle out. As a result, the sarcolemma reverses polarity and its voltage quickly jumps from the resting membrane potential of -90mV to as high as +75mV as sodium enters. The membrane potential then becomes hyperpolarized when potassium exits and is then adjusted back to the resting membrane potential. This rapid fluctuation is called the end-plate potential The voltage-gated ion channels of the sarcolemma next to the end plate open in response to the end plate potential. 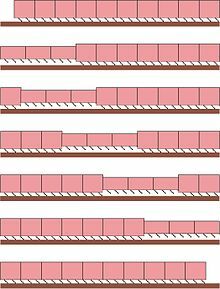 These voltage-gated channels are sodium and potassium specific and only allow one through. This wave of ion movements creates the action potential that spreads from the motor end plate in all directions. If action potentials stop arriving, then acetylcholine ceases to be released from the terminal bouton. The remaining acetylcholine in the synaptic cleft is either degraded by active acetylcholine esterase or reabsorbed by the synaptic knob and none is left to replace the degraded acetylcholine. declines back to resting levels, the force declines and relaxation occurs. The sliding filament theory describes a process used by muscles to contract. It is a cycle of repetitive events that cause a thin filament to slide over a thick filament and generate tension in the muscle. It was independently developed by Andrew Huxley and Rolf Niedergerke and by Hugh Huxley and Jean Hanson in 1954. 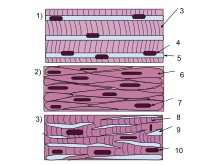 Physiologically, this contraction is not uniform across the sarcomere; the central position of the thick filaments becomes unstable and can shift during contraction. However the actions of elastic proteins such as titin are hypothesised to maintain uniform tension across the sarcomere and pull the thick filament into a central position. complex causes tropomyosin to slide over and unblock the remainder of the actin binding site. Unblocking the rest of the actin binding sites allows the two myosin heads to close and myosin to bind strongly to actin. The myosin head then releases the inorganic phosphate and initiates a power stroke, which generates a force of 2 pN. The power stroke moves the actin filament inwards, thereby shortening the sarcomere. Myosin then releases ADP but still remains tightly bound to actin. 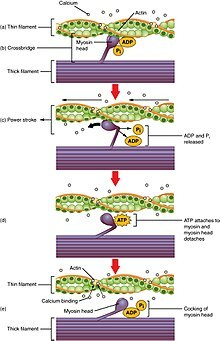 At the end of the power stroke, ADP is released from the myosin head, leaving myosin attached to actin in a rigor state until another ATP binds to myosin. A lack of ATP would result in the rigor state characteristic of rigor mortis. Once another ATP binds to myosin, the myosin head will again detach from actin and another crossbridges cycle occurs. ions from the troponin. Thus, the tropomyosin-troponin complex again covers the binding sites on the actin filaments and contraction ceases. The strength of skeletal muscle contractions can be broadly separated into twitch, summation, and tetanus. A twitch is a single contraction and relaxation cycle produced by an action potential within the muscle fiber itself. The time between a stimulus to the motor nerve and the subsequent contraction of the innervated muscle is called the latent period, which usually takes about 10 ms and is caused by the time taken for nerve action potential to propagate, the time for chemical transmission at the neuromuscular junction, then the subsequent steps in excitation-contraction coupling. If another muscle action potential were to be produced before the complete relaxation of a muscle twitch, then the next twitch will simply sum onto the previous twitch, thereby producing a summation. Summation can be achieved in two ways: frequency summation and multiple fiber summation. In frequency summation, the force exerted by the skeletal muscle is controlled by varying the frequency at which action potentials are sent to muscle fibers. Action potentials do not arrive at muscles synchronously, and, during a contraction, some fraction of the fibers in the muscle will be firing at any given time. 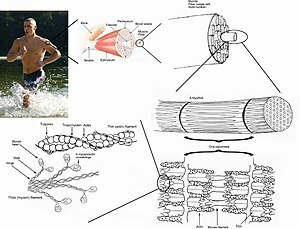 In a typical circumstance, when a human is exerting a muscle as hard as he/she is consciously able, roughly one-third of the fibers in that muscle will be firing at once, though this ratio can be affected by various physiological and psychological factors (including Golgi tendon organs and Renshaw cells). This 'low' level of contraction is a protective mechanism to prevent avulsion of the tendon—the force generated by a 95% contraction of all fibers is sufficient to damage the body. In multiple fiber summation, if the central nervous system sends a weak signal to contract a muscle, the smaller motor units, being more excitable than the larger ones, are stimulated first. As the strength of the signal increases, more motor units are excited in addition to larger ones, with the largest motor units having as much as 50 times the contractile strength as the smaller ones. As more and larger motor units are activated, the force of muscle contraction becomes progressively stronger. A concept known as the size principle, allows for a gradation of muscle force during weak contraction to occur in small steps, which then become progressively larger when greater amounts of force are required. Finally, if the frequency of muscle action potentials increases such that the muscle contraction reaches its peak force and plateaus at this level, then the contraction is a tetanus. Length-tension relationship relates the strength of an isometric contraction to the length of the muscle at which the contraction occurs. Muscles operate with greatest active tension when close to an ideal length (often their resting length). When stretched or shortened beyond this (whether due to the action of the muscle itself or by an outside force), the maximum active tension generated decreases. This decrease is minimal for small deviations, but the tension drops off rapidly as the length deviates further from the ideal. Due to the presence of elastic proteins within a muscle cell (such as titin) and extracellular matrix, as the muscle is stretched beyond a given length, there is an entirely passive tension, which opposes lengthening. Combined together, there is a strong resistance to lengthening an active muscle far beyond the peak of active tension. Force–velocity relationship: right of the vertical axis concentric contractions (the muscle is shortening), left of the axis eccentric contractions (the muscle is lengthened under load); power developed by the muscle in red. Since power is equal to force times velocity, the muscle generates no power at either isometric force (due to zero velocity) or maximal velocity (due to zero force). The optimal shortening velocity for power generation is approximately one-third of maximum shortening velocity. Force–velocity relationship relates the speed at which a muscle changes its length (usually regulated by external forces, such as load or other muscles) to the amount of force that it generates. Force declines in a hyperbolic fashion relative to the isometric force as the shortening velocity increases, eventually reaching zero at some maximum velocity. The reverse holds true for when the muscle is stretched – force increases above isometric maximum, until finally reaching an absolute maximum. This intrinsic property of active muscle tissue plays a role in the active damping of joints which are actuated by simultaneously-active opposing muscles. In such cases, the force-velocity profile enhances the force produced by the lengthening muscle at the expense of the shortening muscle. This favoring of whichever muscle returns the joint to equilibrium effectively increases the damping of the joint. Moreover, the strength of the damping increases with muscle force. The motor system can thus actively control joint damping via the simultaneous contraction (co-contraction) of opposing muscle groups. Swellings called varicosities belonging to an autonomic neuron innervate the smooth muscle cells. Smooth muscles can be divided into two subgroups: single-unit (unitary) and multi-unit. Single-unit smooth muscle cells can be found in the gut and blood vessels. Because these cells are linked together by gap junctions, they are able to contract as a syncytium. Single-unit smooth muscle cells contract myogenically, which can be modulated by the autonomic nervous system. Unlike single-unit smooth muscle cells, multi-unit smooth muscle cells are found in the muscle of the eye and in the base of hair follicles. Multi-unit smooth muscle cells contract by being separately stimulated by nerves of the autonomic nervous system. As such, they allow for fine control and gradual responses, much like motor unit recruitment in skeletal muscle. ions are also required for crossbridge cycling in smooth muscle cells. binding to the troponin complex that regulates myosin binding sites on actin like in skeletal and cardiac muscles. Although smooth muscle contractions are myogenic, the rate and strength of their contractions can be modulated by the autonomic nervous system. Postganglionic nerve fibers of parasympathetic nervous system release the neurotransmitter acetylcholine, which binds to muscarinic acetylcholine receptors (mAChRs) on smooth muscle cells. These receptors are metabotropic, or G-protein coupled receptors that initiate a second messenger cascade. Conversely, postganglionic nerve fibers of the sympathetic nervous system release the neurotransmitters epinephrine and norepinephrine, which bind to adrenergic receptors that are also metabotropic. The exact effects on the smooth muscle depend on the specific characteristics of the receptor activated—both parasympathetic input and sympathetic input can be either excitatory (contractile) or inhibitory (relaxing). There are two types of cardiac muscle cells: autorhythmic and contractile. Autorhythmic cells do not contract, but instead set the pace of contraction for other cardiac muscle cells, which can be modulated by the autonomic nervous system. In contrast, contractile muscle cells (cardiomyocytes) constitute the majority of the heart muscle and are able to contract. through the L-type calcium channels. Furthermore, cardiac muscle tend to exhibit diad (or dyad) structures, rather than triads. The cytoplasmic calcium binds to Troponin C, moving the tropomyosin complex off the actin binding site allowing the myosin head to bind to the actin filament. From this point on, the contractile mechanism is essentially the same as for skeletal muscle (above). Briefly, using ATP hydrolysis, the myosin head pulls the actin filament toward the centre of the sarcomere. concentration allows the troponin complex to dissociate from the actin filament thereby ending contraction. The heart relaxes, allowing the ventricles to fill with blood and begin the cardiac cycle again. In annelids such as earthworms and leeches, circular and longitudinal muscles cells form the body wall of these animals and are responsible for their movement. In an earthworm that is moving through a soil, for example, contractions of circular and longitudinal muscles occur reciprocally while the coelomic fluid serves as a hydroskeleton by maintaining turgidity of the earthworm. When the circular muscles in the anterior segments contract, the anterior portion of animal's body begins to constrict radially, which pushes the incompressible coelomic fluid forward and increasing the length of the animal. As a result, the front end of the animal moves forward. As the front end of the earthworm becomes anchored and the circular muscles in the anterior segments become relaxed, a wave of longitudinal muscle contractions passes backwards, which pulls the rest of animal's trailing body forward. These alternating waves of circular and longitudinal contractions is called peristalsis, which underlies the creeping movement of earthworms. Invertebrates such as annelids, mollusks, and nematodes, possess obliquely striated muscles, which contain bands of thick and thin filaments that are arranged helically rather than transversely, like in vertebrate skeletal or cardiac muscles. In bivalves, the obliquely striated muscles can maintain tension over long periods without using too much energy. Bivalves use these muscles to keep their shells closed. Asynchronous muscles power flight in most insect species. a: Wings b: Wing joint c: Dorsoventral muscles power the upstroke d: Dorsolongitudinal muscles (DLM) power the downstroke. The DLMs are oriented out of the page. Advanced insects such as wasps, flies, bees, and beetles possess asynchronous muscles that constitute the flight muscles in these animals. These flight muscles are often called fibrillar muscles because they contain myofibrils that are thick and conspicuous. A remarkable feature of these muscles is that they do not require stimulation for each muscle contraction. Hence, they are called asynchronous muscles because the number of contractions in these muscles do not correspond (or synchronize) with the number of action potentials. For example, a wing muscle of a tethered fly may receive action potentials at a frequency of 3 Hz but it is able to beat at a frequency of 120 Hz. The high frequency beating is made possible because the muscles are connected to a resonant system, which is driven to a natural frequency of vibration. 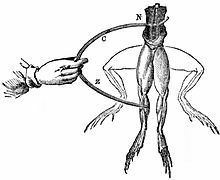 In 1780, Luigi Galvani discovered that the muscles of dead frogs' legs twitched when struck by an electrical spark. This was one of the first forays into the study of bioelectricity, a field that still studies the electrical patterns and signals in tissues such as nerves and muscles. In 1952, the term excitation–contraction coupling was coined to describe the physiological process of converting an electrical stimulus to a mechanical response. This process is fundamental to muscle physiology, whereby the electrical stimulus is usually an action potential and the mechanical response is contraction. Excitation–contraction coupling can be dysregulated in many diseases. Though excitation–contraction coupling has been known for over half a century, it is still an active area of biomedical research. The general scheme is that an action potential arrives to depolarize the cell membrane. By mechanisms specific to the muscle type, this depolarization results in an increase in cytosolic calcium that is called a calcium transient. This increase in calcium activates calcium-sensitive contractile proteins that then use ATP to cause cell shortening. The mechanism for muscle contraction evaded scientists for years and requires continued research and updating. The sliding filament theory was independently developed by Andrew F. Huxley and Rolf Niedergerke and by Hugh Huxley and Jean Hanson. Their findings were published as two consecutive papers published in the 22 May 1954 issue of Nature under the common theme "Structural Changes in Muscle During Contraction". ^ a b c d e f g h i j k l m n o Widmaier, Eric P.; Raff, Hersel; Strang, Kevin T. (2010). "Muscle". Vander's Human Physiology: The Mechanisms of Body Function (12th ed.). New York, NY: McGraw-Hill. pp. 250–291. ISBN 978-0-321-98122-6. ^ Silverthorn, Dee Unglaub (2016). "Muscles". Human Physiology: An Integrated Approach (7th ed.). San Francisco, CA: Pearson. pp. 377–416. ISBN 978-0-321-98122-6. ^ a b c d e f Aidley, David J. (1998). "Mechanics and energetics of muscular contraction". The Physiology of Excitable Cells (4th ed.). New York, NY: Cambridge University Press. pp. 323–335. ISBN 978-0-521-57421-1. ^ a b c d e f Sircar, Sabyasachi (2008). "Muscle elasticity". Principles of Medical Physiology (1st ed.). New York, NY: Thieme. p. 113. ISBN 978-1-588-90572-7. ^ a b c d e f Bullock, John; Boyle, Joseph; Wang, Michael B. (2001). "Muscle contraction". NMS Physiology. 578 (4th ed.). Baltimore, Maryland: Lippincott Williams and Wilkins. pp. 37–56. ^ a b Kumar, Shrawan (2008). "Introduction and terminology". In Shrawan Kumar (ed.). Muscle strength (1st ed.). Boca Raton, FL: CRC Press. p. 113. ISBN 978-0-415-36953-4. ^ a b Biewener, Andrew A. (2003). "Muscles and skeletons: The building blocks of animal movement". Animal Locomotion. Oxford Animal Biology Series. New York, NY: Oxford University Press. pp. 15–45. ISBN 978-0-198-50022-3. ^ Faulkner JA (2003). "Terminology for contractions of muscles during shortening, while isometric, and during lengthening". Journal of Applied Physiology. 95 (2): 455–459. doi:10.1152/japplphysiol.00280.2003. PMID 12851415. ^ a b "Types of contractions". 2006-05-31. Retrieved 2007-10-02. ^ a b c Colliander EB, Tesch PA (1990). "Effects of eccentric and concentric muscle actions in resistance training". Acta Physiol. Scand. 140 (1): 31–9. doi:10.1111/j.1748-1716.1990.tb08973.x. PMID 2275403. ^ Nikolaidis MG, Kyparos A, Spanou C, Paschalis V, Theodorou AA, Vrabas IS (2012). "Redox biology of exercise: an integrative and comparative consideration of some overlooked issues". J. Exp. Biol. 215 (Pt 10): 1615–25. doi:10.1242/jeb.067470. PMID 22539728. ^ Brooks, G.A; Fahey, T.D. ; White, T.P. (1996). Exercise Physiology: Human Bioenergetics and Its Applications. (2nd ed.). Mayfield Publishing Co.
^ Alfredson, H; Pietilä, T; Jonsson, P; Lorentzon, R (1998). "Heavy-load eccentric calf muscle training for the treatment of chronic Achilles tendinosis". The American Journal of Sports Medicine. 26 (3): 360–6. doi:10.1177/03635465980260030301. PMID 9617396. ^ Satyendra L, Byl N (2006). "Effectiveness of physical therapy for Achilles tendinopathy: An evidence based review of eccentric exercises". Isokinetics and Exercise Science. 14 (1): 71–80. doi:10.3233/IES-2006-0223. ^ annell LJ, Taunton JE, Clement DB, Smith C, Khan KM (2001). "A randomised clinical trial of the efficacy of drop squats or leg extension/leg curl exercises to treat clinically diagnosed jumper's knee in athletes: pilot study". Br J Sports Med. 35 (1): 60–4. doi:10.1136/bjsm.35.1.60. PMC 1724276. PMID 11157465. ^ Tassinary; Cacioppo (2000). "The Skeletomotor system: surface electromyography". In Cacioppo, John T.; Tassinary, Luois G.; Berntson, Gary G. (eds.). Handbook of Psychophysiology (Second ed.). Cambridge: Cambridge University Press. ISBN 978-0-521-62634-7. ^ Levitan, Irwin; Kaczmarek, Leonard (August 19, 2015). "Intercellular communication". The Neuron: Cell and Molecular Biology (4th ed.). New York, NY: Oxford Univerty Press. pp. 153–328. ISBN 978-0199773893. ^ a b Saladin, Kenneth S., Stephen J. Sullivan, and Christina A. Gan. Anatomy & Physiology: The Unity of Form and Function. 7th ed. New York: McGraw-Hill Education, 2015. Print. ^ a b Sandow A (1952). "Excitation-Contraction Coupling in Muscular Response". Yale J Biol Med. 25 (3): 176–201. PMC 2599245. PMID 13015950. ^ Saladin, Kenneth (2012). Anatomy and Physiology: The Unity of Form and Function. New York: McGraw Hill. ISBN 978-0-07-337825-1. ^ a b Huxley AF, Niedergerke R (1954). "Structural Changes in Muscle During Contraction: Interference Microscopy of Living Muscle Fibres". Nature. 173 (4412): 971–973. Bibcode:1954Natur.173..971H. doi:10.1038/173971a0. PMID 13165697. ^ a b Huxley H, Hanson J (1954). "Changes in the cross-striations of muscle during contraction and stretch and their structural interpretation". Nature. 173 (4412): 973–976. Bibcode:1954Natur.173..973H. doi:10.1038/173973a0. PMID 13165698. ^ Horowits R, Podolsky RJ (November 1987). "The positional stability of thick filaments in activated skeletal muscle depends on sarcomere length: evidence for the role of titin filaments". J. Cell Biol. 105 (5): 2217–23. doi:10.1083/jcb.105.5.2217. PMC 2114850. PMID 3680378. ^ a b c Enoka, Roger M.; Pearson, Keir G. (2013). "The motor unit and muscle action". In Eric R. Kandel; James H. Schwartz; Thomas M. Jessell; Steven A. Siegelbaum; A. J. Hudspeth (eds.). Principles of Neural Science (5th ed.). New York, NY: McGraw-Hill Medical. pp. 768–789. ISBN 978-0-071-39011-8. ^ Feher, Joseph (2012). "Chapter 3.4: Skeletal muscle mechanics". Quantitative Human Physiology: An Introduction. Academic Press Series in Biomedical Engineering (1st ed.). New York, NY: Academic Press. pp. 239–248. ISBN 978-0-123-82163-8. ^ Khurana, Indu (2006). "Characteristics of muscle excitability and contractility". Textbook Of Medical Physiology (1st ed.). Elsevier. pp. 101–2. ^ Shwedyk, E.; Balasubramanian, R.; Scott, R. N. (1977). "A nonstationary model for the Electromyogram". IEEE Transactions on Biomedical Engineering. 24 (5): 417–424. doi:10.1109/TBME.1977.326175. PMID 892834. ^ Gordon AM, Huxley AF, Julian FJ (1966). "The variation in isometric tension with sarcomere length in vertebrate muscle fibres". J. Physiol. 184 (1): 170–92. doi:10.1113/jphysiol.1966.sp007909. PMC 1357553. PMID 5921536. ^ Heitmann, Stewart; Ferns, Norm; Breakpsear, Michael (2011). "Muscle co-contraction modulates damping and joint stability in a three-link biomechanical limb". Frontiers in Neurorobotics. 5: 5. doi:10.3389/fnbot.2011.00005. ISSN 1662-5218. PMC 3257849. PMID 22275897. ^ a b Fabiato, A. (1983). "Calcium-induced calcium release from the cardiac sarcoplasmic reticulum". American Journal of Physiology. 245 (1): C1–14. doi:10.1152/ajpcell.1983.245.1.C1. PMID 6346892. ^ Cheng H, Lederer WJ, Cannell MB (October 1993). "Calcium sparks: elementary events underlying excitation-contraction coupling in heart muscle". Science. 262 (5134): 740–4. Bibcode:1993Sci...262..740C. doi:10.1126/science.8235594. PMID 8235594.
i during excitation-contraction coupling in cardiac myocytes". Biophys. J. 67 (5): 1942–56. Bibcode:1994BpJ....67.1942C. doi:10.1016/S0006-3495(94)80677-0. PMC 1225569. PMID 7858131. ^ M., Bers, D. (2001). Excitation-contraction coupling and cardiac contractile force (2nd ed.). Dordrecht: Kluwer Academic Publishers. ISBN 9780792371571. OCLC 47659382. ^ Crespo LM, Grantham CJ, Cannell MB (June 1990). "Kinetics, stoichiometry and role of the Na-Ca exchange mechanism in isolated cardiac myocytes". Nature. 345 (6276): 618–21. Bibcode:1990Natur.345..618C. doi:10.1038/345618a0. PMID 2348872. ^ a b Hillis, David M.; Sadava, David E.; Price, Mary V. (2014). "Muscle and movement". Principles of Life (2nd ed.). Sunderland, MA: Sinauer Associates. pp. 681–698. ISBN 978-1-464-10947-8. ^ a b Gardner, C.R. (1976). "The neuronal control of locomotion in the earthworm". Biological Reviews of the Cambridge Philosophical Society. 51 (1): 25–52. doi:10.1111/j.1469-185X.1976.tb01119.x. PMID 766843. ^ a b c Alexander, R. McNeill (2003). "Muscle, the motor". Principles of Animal Locomotion (2nd ed.). Princeton, NJ: Princeton University Press. pp. 15–37. ISBN 978-0-691-12634-0. ^ Josephson, R. K.; Malamud, J. G.; Stokes, D. R. (2000-09-15). "Asynchronous muscle: a primer". Journal of Experimental Biology. 203 (18): 2713–2722. ISSN 0022-0949. PMID 10952872. ^ Huxley, H. E. (April 2000). "Past, Present and Future Experiments on Muscle". Philosophical Transactions: Biological Sciences. 355 (1396): 539–543. doi:10.1098/rstb.2000.0595. JSTOR . 3066716 .. PMC 1692762. PMID 10836507. Saladin, Kenneth S., Stephen J. Sullivan, and Christina A. Gan. (2015). Anatomy & Physiology: The Unity of Form and Function. 7th ed. New York: McGraw-Hill Education.